If you're looking for the best DIY Christmas projects, this post is your one-stop shop for all sorts of homemade Christmas crafts you can DIY! How many parties do you host every year? I’m pretty sure every feast you had has left you with a couple of empty wine bottles lying around. Those scraps will be perfect for this easy lighting project. Share the Christmas spirit before anyone even steps inside your home. Adorn your front door with any of these 13 beautiful Christmas wreaths you can make yourself. Brighten up your home by decorating with Christmas lanterns. Set the mood and let everyone feel the holiday glow outdoors and even indoors. You don’t even have to hang all of them. The store-bought Christmas star is a thing of the past! It’s time to get creative and make your own DIY Christmas tree topper. Make it stand out! Can you imagine your Christmas decor without the stockings? I'm sure you can’t. Every year my children would hang theirs, and every year, I keep on looking for amazing DIY Christmas stocking tutorials to top the previous year. Do you want to go for a rustic look this Christmas? Well, you’re in luck. You’ll have 30 breathtaking homemade Christmas decor ideas that will give your home the rustic charm you’re looking for. What Is Rustic? It is a style that denotes simplicity, rural, plain, or countryside. Tree decorating becomes much more special when you and your family spend time making the ornaments. Get the chance to pick your favorite from this list of 23 DIY homemade Christmas ornaments. If you have a lot of scrap fabric lying around, then you can make use of them by turning them into DIY ornaments. 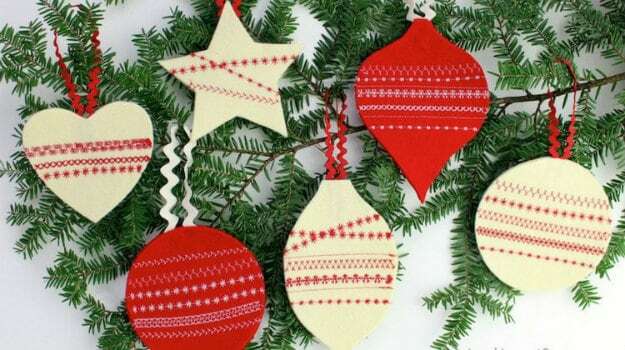 Take inspiration from this list of 51 easy breezy Christmas ornaments you can sew this holiday. Don’t really want to go over-the-top? Then, you can probably get into the minimalist trend with these 11 minimalist Christmas decor ideas. It can be your new go-to decor for Christmas because less is more! I also have something for those who are budget-conscious: 12 exciting dollar store Christmas tree decorating ideas. Your decorations don’t have to be sparse when all it takes is a little craftiness and a trip to the nearest dollar store! We have here 17 fantastic ways to make advent calendars with the same happy effect. It gets you more excited about the holidays with each flap, or in this case, envelope you open. Some of the best DIY Christmas projects using native plants are here. You can surely decorate your garden for Christmas, but have you checked to see if there are plants in your garden you can use for natural decor? If you don’t, then better get started so you’ll have the must-have Christmas garden plants for next year. My friend Bailey always said, “If you can’t decide what motif to go with on your Christmas decor, start by sewing your own Christmas pillow!” And I do believe her. She’s been basing her Christmas decor on her pillows and I have to tell you, it’s always been amazing. Something small, useful, and budget-friendly, that’s what this list is all about. Get ready to fill those stockings with these 15 stocking stuffing ideas you’ll love to make and they’ll love to receive! Moving furniture around is DIY interior decorating in my book. That’s why I made sure I have festive furniture ideas for the holiday. And I didn’t stop there, I made sure my kitchen is celebration-ready too. If you follow even just these 5 tips on Christmas decorating and designing, you can never go wrong. The aesthetics are great, but what if you can set the bar higher by making your home smell like Christmas? Help yourself to some of the best DIY Christmas projects to keep your home smelling warm and cheery in time for Christmas. If you can crochet in time for Christmas, then better get started on one or a couple of these crochet blanket ideas. Anyone will love to receive a gift they can snuggle up in. Did you know there are a lot of gift ideas you can make out of sheep’s wool? From cute tiny felted sheep to scented wool dryer balls, the choices are endless. When I was a teen, I would love any cute and usable gift. But this gift list right here would be the perfect one for me and every teen in your life for that matter. It would be hard to make your own knife or probably craft a gadget for the man who loses his keys all the time. So there’s really no harm in giving him a few manly things you can buy. And for those instances when you can’t think of what to get him, instead of a coin toss, why not take a quiz. For the lovely women in your life! Let’s remember that they need a lot of pampering and relaxation so bath bombs and candles should be on the top of your list. Never forget your children’s teachers. They shape the minds of your young ones and take care of them when they’re in school. I love these 15 Christmas gift ideas, but if you ask me, if I could gift them with more patience, I probably would. Homesteaders are all about self-sufficiency and living off the land. So they’ll surely appreciate any of these 19 gifts you made yourself. Mason jars, canning kits, and fire starters are always welcome. At least that’s what my friend Riley said. She was even kind enough to paint me a picture of what a homesteader’s Christmas looks like. There are just some friends or even family members that can sure use a good laugh. So for those people on your list, give them something fun and weird. They’ll either love you or hate you for it, but hey, it’s the thought that counts right? There is your family, your friend,s and then everyone else. Just kidding! But seriously, you have classmates, officemates, that sweet old lady across the street. You better have something everyone will love, and I’m proud to say, this list has it all! Just when you thought you had gifts for everyone, Uncle Johnny arrives with his family and you’re not prepared. That’s when these 10 last minute gift ideas come in handy; you can really whip them up in a couple of minutes. Make your ugly Christmas sweater extra ugly this year by making your own. And you don’t have to settle on one design, you can choose from 12 designs to keep the Christmas spirit going. From creative homemade gifts to Christmas decor ideas, we have some of the best DIY Christmas projects for you to work on this cold, stay-home season. Whether you want some simple Christmas crafts to make or creative DIY Christmas gifts, we hope you found the best DIY Christmas projects for you. Get crafting now and have a happy holiday! What are the best DIY Christmas projects from this roundup for you, so far? Let us know what you think about them in the comments section below! What happened to the directions for the lighted stars?